Our sculptor did not have the best materials: he used lime- or sandstone from Breitenbrunn on the Neusiedlersee near Vienna. (That is far enough away that I wonder whether there are deposits of “Breitenbrunn stone” closer to Großlobming). 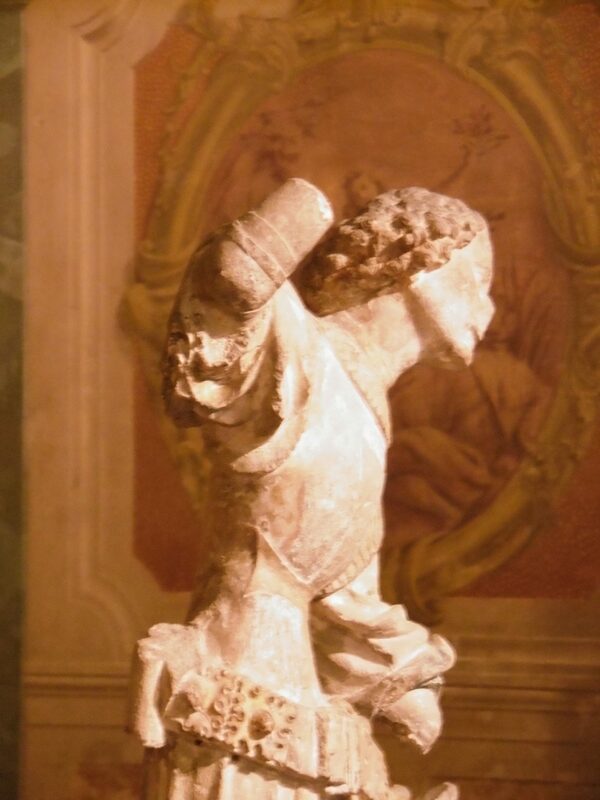 The local church could not afford marble or alabaster, so the good knight has lost his hands and part of his shield. 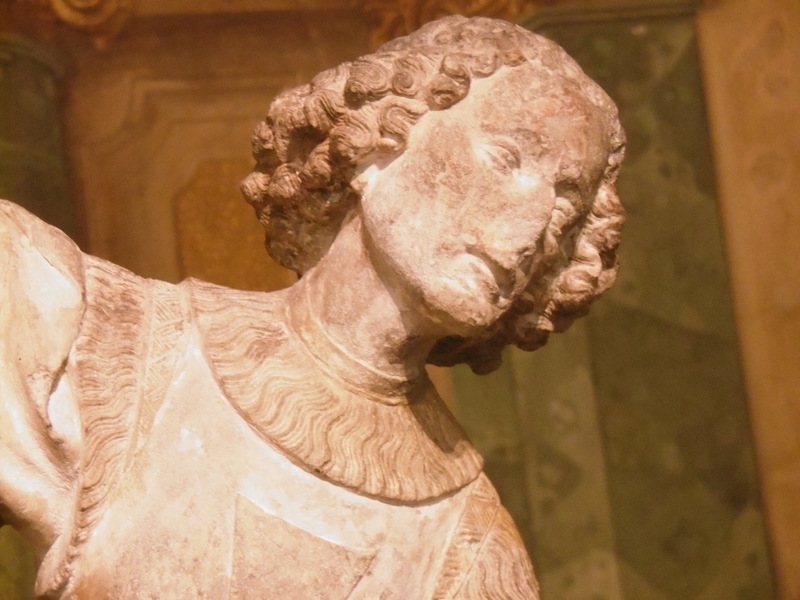 St. George wears a low collar with a wide, tasselled skirt over his coat armour. It probably hides a collar of mail, either sewn to the tassels or worn underneath his other garments. I am not sure that the expression on his face is the most effective … slaying dragons is serious work which demands concentration. In contrast, the dragon has more expression, even though the lance which transfixes him is now missing. His neck writhes and his tail coils around St. George’s right leg. 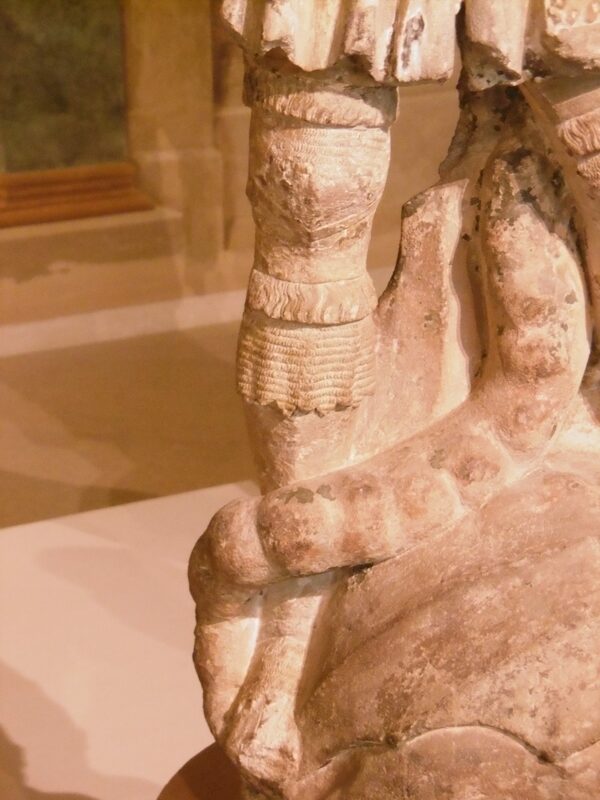 Look at how the master has marked the bones of his spine and the joints of his toes! If you take St. George’s proportions, you will find one measure across the waist, three measures from waist to crown, and five measures from the waist to the sole of the left foot. At about the time that the master was decorating the church, Cennino Cennini recommended 10 parts above the navel to 16 below which is almost the same proportion. Lets have a look at his chest from the side. Look at those lovely curves, the subtle one up the back, and the sharper ones at the skirt in front and up the breast. It is possible that St. George’s armour does not have a backplate to help give him a fashionable profile … creating a backplate with medieval steel is hard, because it needs to be wide and thin with subtle shaping. But armour kept that high waistline from the 1360s into the 16th century, when in some parts of Europe the waistline started to drop in front towards the groin. We have four surviving quilted garments from late 14th century Europe, and all have an exaggerated deep breast and narrow waist, leaving room between the clothing and the breast and possibly pulling in the belly slightly. A little bit earlier, Geoffrey Charney complained that some knights were wearing armour which prevented them from breathing properly, but armourers today find that that they can make the body armour an inch or two narrower from side to side than the wearer and still provide comfortable, flexible protection. The broad, low belt with applied decorations is very Germanic. In the late 14th century, these knight’s belts or “arsegirdles” were usually of silver or silver-gilt and weighed several pounds. The appliques were probably hollow for maximum splendour. In most countries, they were narrower and had no dangling tail. I am not aware of any which survive, since the point of having silver was that you could melt it down when fashions changed or you needed money. A number of companies in eastern Europe imitate them in bronze and enamel today. 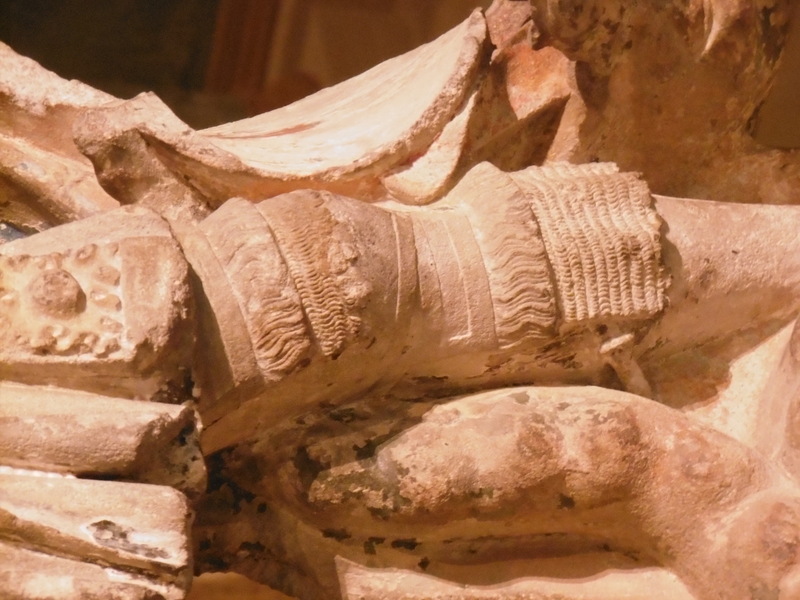 Moving down, we see another of the glories of late 14th century armour: the use of mixed media. Over the course of about a hundred years, armourers learned to cover every part of the body with wrought steel plates. But before they reached that point, they played with combinations of different materials for different parts of the body. All of these experiments have been lost, because none of them survives as well as large steel plates solidly riveted to one another. 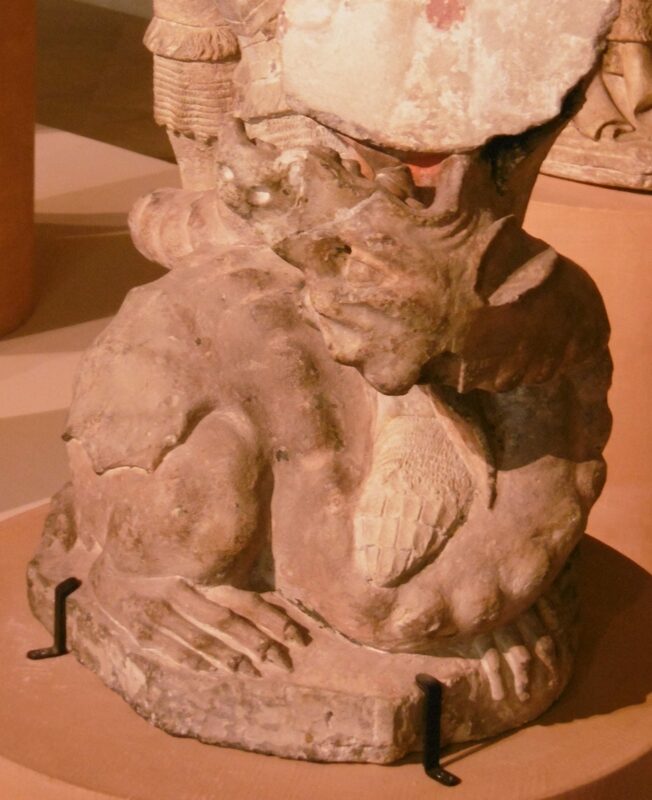 But written sources and fragments from excavations give us a pretty good idea of how he is armed. On his thighs St. George has smooth plates with applied borders, probably iron or steel bordered in brass. Below them hangs a tasselled fringe and a skirt of mail. These probably cover another plate which joins his thigh armour to his knees: several pieces made this way but without the curtains were preserved in Schloss Churburg and are now there (#22, 53, 54) and in the Royal Armouries, Leeds (III.1285, III.1286, and Ref_arm_2922 in Matthias Goll’s thesis). Below them he has knee armour with two lames below to articulate as his leg bends. 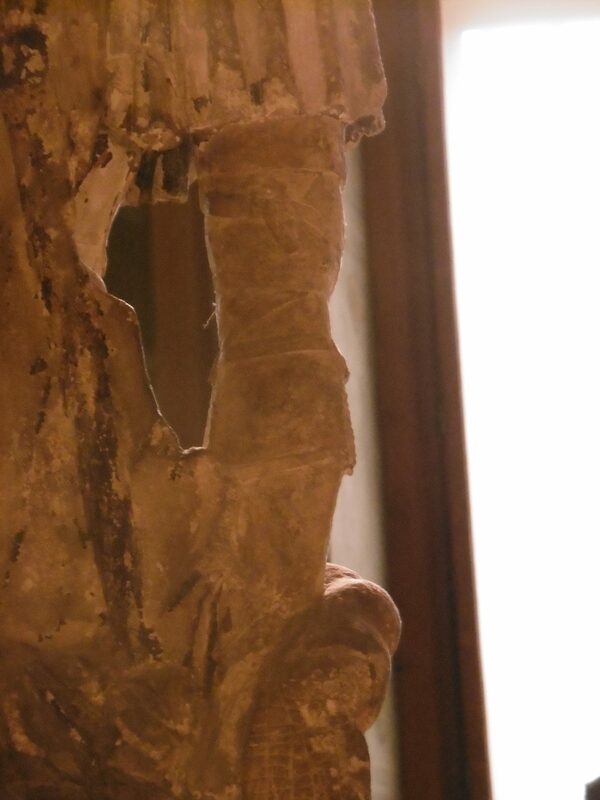 These also have a tasseled fringe and skirt of mail draped below them to ensure that no weapon gets betweeen them and the greaves, which could be iron or hardened leather. Skirts of mail below the knee remained fashionable well into the 15th century, so several examples survive, but the curtain above the knee is very unusual. No hinges or means of closing are marked, but the master has carefully sculpted straps and buckles on the back of the legs. The good saint’s shoes are another beautiful example of mixed materials. A long fringe of mail falls from under his greaves and covers the middle of the foot. It ends in a fashionable zig-zag pattern of “dags”: sometimes these were made of brass rings to make them stand out. How delicate are the rings! 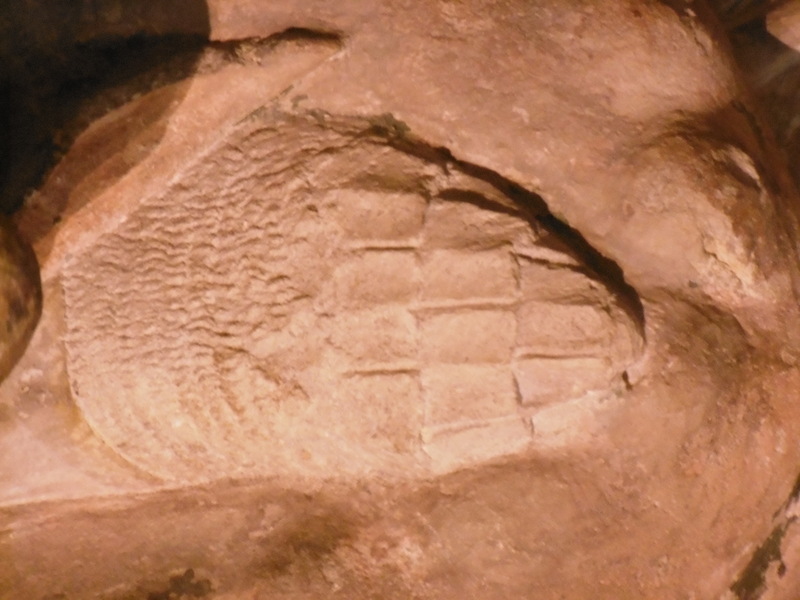 Underneath his shoes are covered by a special arrangement of scales with their hollows facing up. Scales are often curved like this, but usually the different rows are staggered so that the joint between scales in one row aligns with the middle of a scale in the row above. 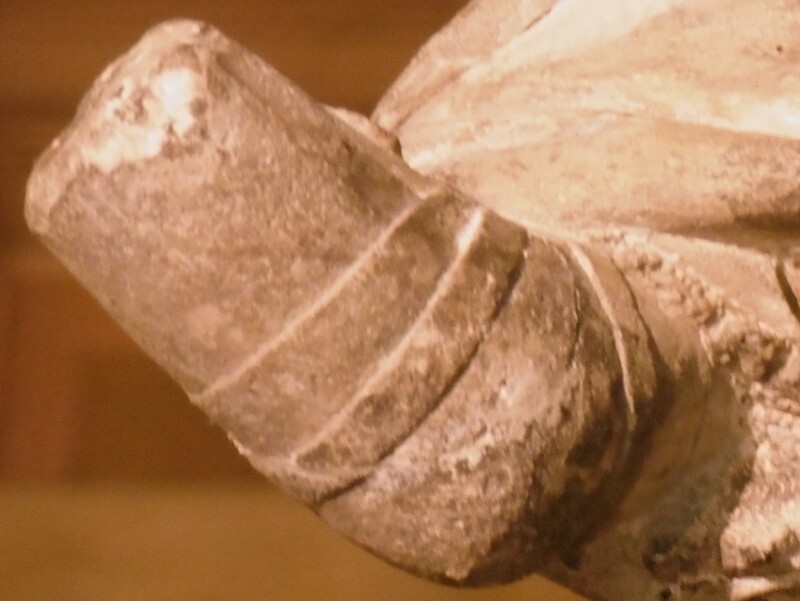 The thigh guards of Japanese armour used a similar arrangement to cover a curved surface. On surviving armour the foot protection was laced to the shoes or held on with straps under the foot, but its possible that these scales are sewn directly to the shoes. His arms show a mixture of old and new. The coat which he wears over his armour has a textured border around the arm openings, and more of the same tasselled fringe is attached. The wide, flowing sleeves and full, knee-length skirt were going out of fashion as they got in the way. A patch of mail protects his inner elbow where the steel plates leave it exposed. These could be the sleeves of a coat of mail, or separate sleeves, or even small patches just the right size to cover the gap. Inventories of armouries and arming scenes in literature show that all three solutions were used in the 14th century. On the other hand, his bracers also show some of the latest technology. The elbows are joined to the tubes protecting his upper and lower arms with narrow lames. 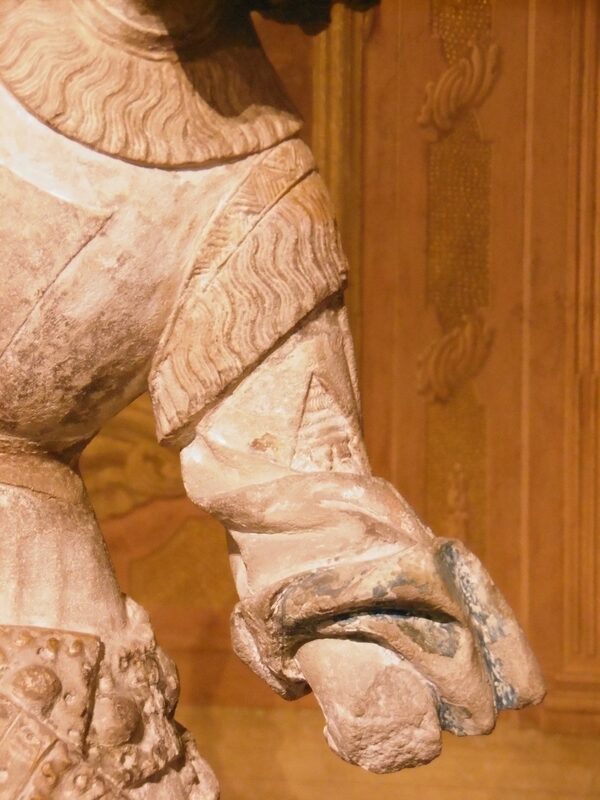 While English armourers had mastered this technique by the 1350s, armourers in the German-speaking countries remained skeptical: as late as the 16th century, many preferred to make the three parts of the arm defence separate or joined with straps. The applied borders were also very fashionable at the end of the 14th century, especially in countries whose armourers preferred big plates joined by clever arrangements of lames and rivets. We don’t know what the Master of Großlobming had in his sketchbook as he planned this sculpture. Nothing exactly like this armour survives. 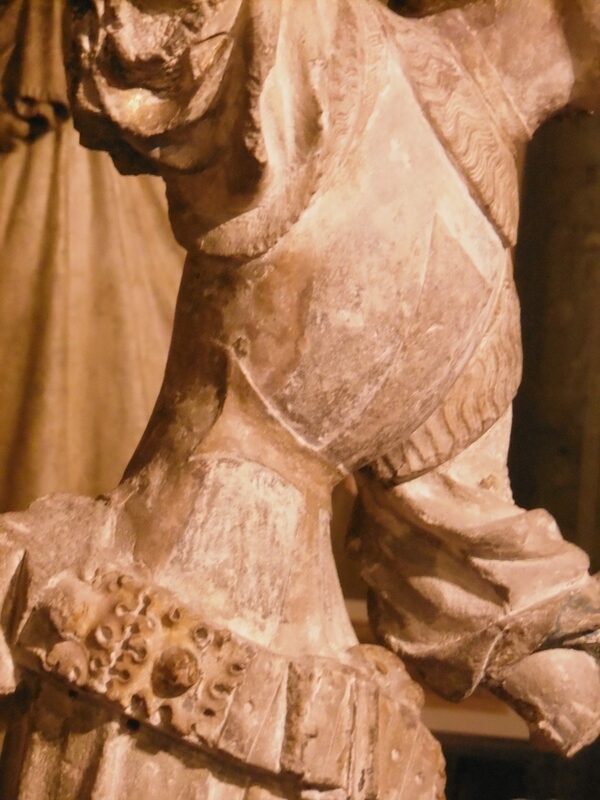 But all of the details fit in a specific place and time, the creative age at the end of the 14th century when armourers were joyfully mixing different shapes and materials as they tried to find a way to turn a man into a deathless statue which leapt and danced and struck. And if you visit the Belvedere, you can stare in awe at his work. 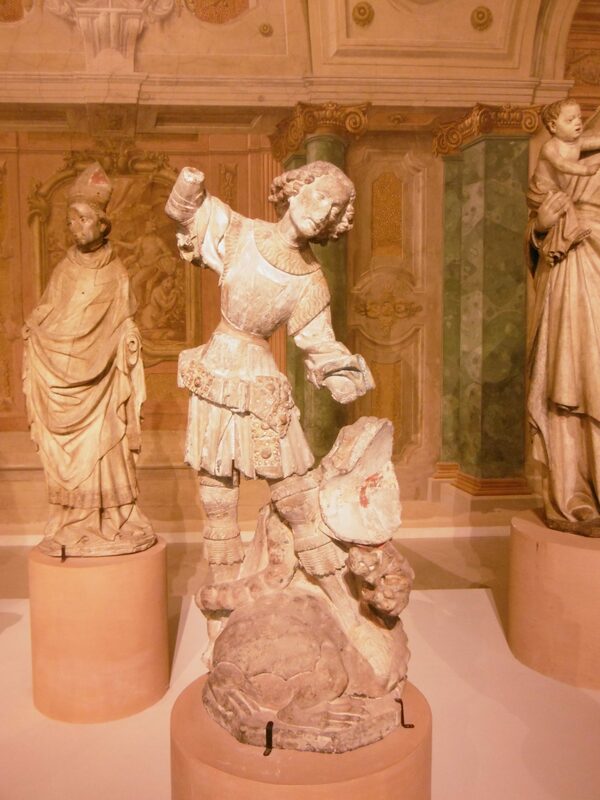 Further Reading: The Belvedere has an online catalogue entry for this statue “Hl. Georg mit dem Drachen”. You can find Cennino Cennini’s canon of proportions from some time before 1437 in section 3/chapter LXX of the Libro dell’Arte. A good book on one of the styles of medieval armour which does not survive is Tobias Capwell, Armour of the English Knight (2015). A good place to start exploring documentary evidence is Roland Thomas Richardson, “The Medieval Inventories of the Tower Armouries” (PhD thesis, Leeds, 2012).